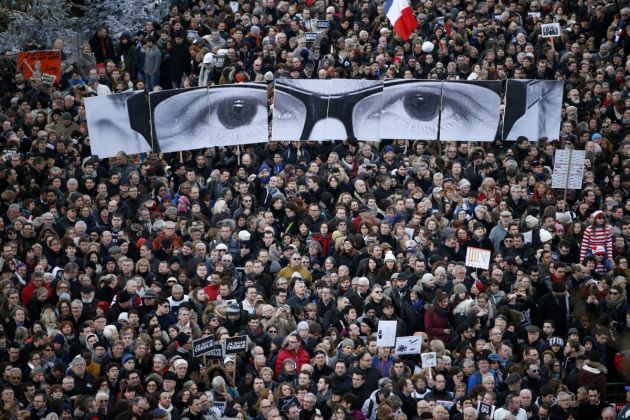 (Photo: REUTERS / Charles Platiau)People hold panels to create the eyes of late Charlie Hebdo editor Stephane Charbonnier, known as "Charb", as hundreds of thousands of French citizens take part in a solidarity march (Marche Republicaine) in the streets of Paris January 11, 2015. French citizens will be joined by dozens of foreign leaders, among them Arab and Muslim representatives, in a march on Sunday in an unprecedented tribute to this week's victims following the shootings by gunmen at the offices of the satirical weekly newspaper Charlie Hebdo, the killing of a police woman in Montrouge, and the hostage taking at a kosher supermarket at the Porte de Vincennes. While more than a million people were marching in a show of unity in Paris against terrorism in rhe name of religion two suspected child suicide bombers blew themselves up in a market in north-east Nigeria, witnesses said . They killed three people in the second apparent attack in two days using young girls strapped with explosives, Reuters news agency reported. The explosions followed what is believed to be the worst attack in the bloody six-year war of terror, when Boko Haram jihadi fighters attacked the Borno town of Baga near the border of Chad and destroyed at least 16 surrounding settlements. "The attack on Baga and surrounding towns, looks as if it could be Boko Haram's deadliest act in a catalogue of increasingly heinous attacks carried out by the group," Amnesty International said in a January 9 statement on the slaughter. "If reports that the town was largely razed to the ground and that hundreds or even as many as 2,000 civilians were killed are true, this marks a disturbing and bloody escalation of Boko Haram's ongoing onslaught against the civilian population," said Daniel Eyre, Nigeria researcher for Amnesty International. The World Council of Churches expressed deep shock over the attacks by Boko Haram in Nigeria, which is said to have cost the lives of more than 2,000 people, including children used in suicide bomb attacks. "A mind-set which deploys young children as bombs and which indiscriminately slaughters women, children and elderly people is beyond outrage, and disqualifies itself from any possible claim to religious justification," read a statement issued by the WCC headquarters in Geneva, Switzerland on January 12. In the statement, the WCC called on the Nigerian government to respond meaningfully to these attacks and to ensure protection of the people from any and all such atrocities. The WCC also joined its voice with those of Nigerian religious leaders who have called for the international community's solidarity and engagement, expressing deep disappointment at the relative – even discriminatory – lack of international media coverage. "As much as the WCC joins in the international solidarity with the people of France in the aftermath of the recent attacks in and near Paris, we are deeply saddened that the tragic events in Nigeria have not attracted equivalent international concern and solidarity," read the statement. The blasts on January 11 struck around mid-afternoon at an open market selling mobile handsets in the town of Potiskum in Yobe state, frequently targeted by Boko Haram, a Sunni Muslim jihadist group. A trader at the market, Sani Abdu Potiskum, said the bombers were about 10 years old, Reuters reported. "I saw their dead bodies. They are two young girls of about 10 years of age ... you only see the plaited hair and part of the upper torso," the trader said. More than 2,000 people are reported to have been killed; more have been injured or abducted over the last few days, in the Nigerian town of Baga, near the border with Chad. On Saturday, Nigerian military units were battling Boko Haram militants who carried out the massacre earlier in the week. Archbishop Ignatius Kaigama, the archbishop of Jos and President of the Nigerian Bishops Conference, told Vatican Radio the numbers of people killed cannot yet be confirmed. The civilian population is, however, bearing the brunt of the conflict in the northeast of the country. "The civilians suffer more, because they have no protection, and I can imagine now that the villages that are said to have been attacked, and their populations, are totally destabilized," said Archbishop Kaigama. He said the Nigerian government has so far not been able to defeat the Boko Haram insurgency, and the Islamist extremist group is expanding its reach, Independent Catholic News reported. Boko Haram has captured a number of local government office. Archbishop Kaigama said. "Villages and towns have fallen under their control, and they declare they have established an Islamic caliphate," the Nigerian Catholic leader said. "They are even expanding to neighbouring countries - like Cameroon and Niger and Chad and so on - which means they are making progress in their own way." Appealing for prayers, the archbishop said the situation has gone beyond what "can be managed at the human level."